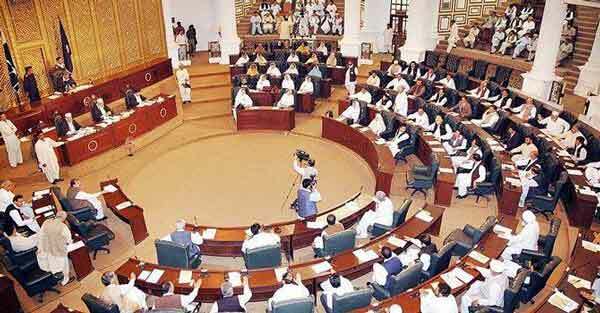 The Khyber Pakhtunkhwa Assembly on Wednesday unanimously passed a resolution against what they termed were “shameless and un-Islamic” slogans and placards raised at Women’s Day march in major cities of the country. The resolution, jointly tabled by members of both the government and opposition members of the assembly, also called for unearthing “the hidden elements involved in a conspiracy to damage of our family system and societal traditions”. The resolution was presented by Rehana Ismail from the Muttahida Majlis e Amal, and carried the signatures of Pakistan People’s Party’s Nighat Orakzai, Awami National Party’s Samar Bilour and Shahida, Ayesha Bano and Ayesha Naeem of the Pakistan Tehreek-e-Insaf. PTI lawmaker Ayesha Bano said that she condemns the ‘wrong aspects’ of the march, and will stand against the un-Islamic points if raised by the people affiliated with the NGOs. MPA Akram Durrani condemned the march saying that such issues are being highlighted which have no links with our traditions or religion. Pakistan Muslim League-Nawaz lawmaker Sardar Yousuf said that the campaign being run in the name of human rights is intolerable.